Students and faculty await the introduction of Psychology's Alumni Advisory Board. 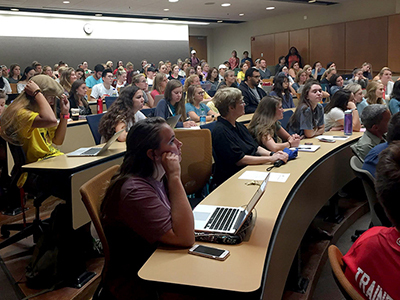 On Friday, September 7, there was an energetic buzz in room 125 of the Psychology Building as students settled into their seats. It was 10 minutes before the presentation, and already every seat was full. The students and faculty were all waiting to meet the inaugural members of the Department of Psychology Alumni Advisory Board. "The alumni board was created to help our department enhance our efforts to engage our alumni so they are better connected to the department," said Vaishali Raval, professor and associate chair of the Department of Psychology. The alumni board will be able to advise the department on current curriculum and how it fits with what skills the students will need to know post-graduation. It is also a resource for students to build a network to help with internship and job searching opportunities. The board is made up of 10 alumni who represent the many diverse career paths a psychology major can take post-graduation. Brooke Spangler introduces Psychology's Alumni Advisory Board. "We have individuals who graduated from Miami between 1974 and 2015," said Raval. "They have work experience in the industry, non-profits, academia, clinical psychology, and medical practices." 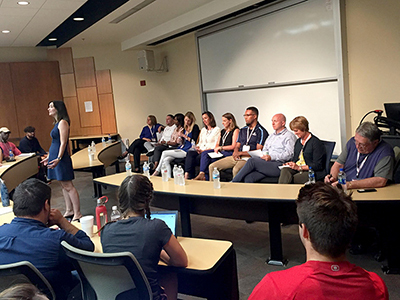 The alumni were invited to campus to speak with students for the first time and answer questions in a panel discussion moderated by associate teaching professor Brooke Spangler and associate professor Paul Flaspohler. Over the course of two hours, they discussed a wide variety of topics including specific career paths, the pros and cons of going to graduate school, and how to stand out in an interview. Although they didn't all end up in the fields they expected, the alumni attributed their background in psychology with their success in leadership. "The best leaders I have worked with are the people with some social science background, because they understand human behavior," said Michele Grisez ('89), who currently works as the senior vice president of human resources at StandardAero, an aerospace company based in southwestern Ohio. Throughout the event, the alumni board members consistently praised Miami for preparing them for their careers through research-based classes and close relationships with the faculty. When asked to tell a favorite memory from their time at Miami, many of them named specific professors they had worked with. They encouraged current students to reach out and make those connections. "I didn't believe asking for help was something I should do," said Stacey Jaffe ('03), a director at Scholastic Inc. "You should look to the faculty as being people who want to see you succeed." Flaspohler wrapped up the event by naming the main takeaways the board discussed. Learn research methods and analysis, statistics, teamwork, critical thinking, and other common soft skills. Do the best you can and know it's going to be valuable to you down the line. Craft and understand your story. It's the activities that matter, not the lines on your degree. You are and will be lifelong learners. You will continue to get new and different life experiences forever. Ask for help. We're here for you. We're all here to help you be successful. After the event, the board members came out to the lobby to talk with students one-on-one and answer further questions. This allowed for students to network and get more information about topics they were interested in. "I appreciated being able to hear the experiences of alumni who were once in my shoes," said Emily Sewall, a senior psychology major. "It was nice to be able to talk to them individually and grab business cards to keep in touch as I search for a job after graduation." The alumni board will serve as a great resource for the Department of Psychology to make sure Miami psychology majors are best prepared for life and careers after they graduate.